From Lombardi's Packers through Brady and the Patriots, here is the ultimate look at the greatest sporting event in America -- the Super Bowl -- through its greatest quarterbacks, coaches, and highlight-reel plays. 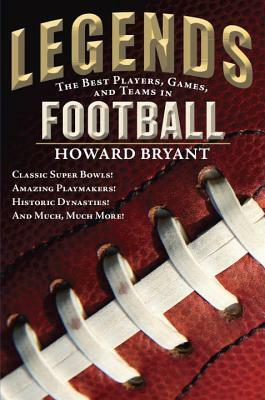 In the second book of the LEGENDS series, ESPN's Howard Bryant delivers THE gridiron guide to most exciting event in sports: the Super Bowl! In this day and age, the gridiron reigns supreme. Football is America's most popular sport and the NFL's star players are instant celebrities with die-hard fans who live and die with each win or loss. And our collective obsession with the game begins when we're just kids and culminates each year on what has become the equivalent of a national holiday—Super Bowl Sunday. Recounting momentous stories of football's past and present, and accompanied by iconic photos, Top Ten Lists to chew on and debate, and a Top 40-style Timeline of Key Moments, this comprehensive collection details twenty of the greatest Super Bowls in NFL history—and expands on their relevance within the larger scope of dynasties, giants of the coaching world, and marquee players making history. From the upsets to the blowouts to the nail-biting finishes, this is the perfect book for young fans eager to kick off their football schooling.